April 22 marks the 49th anniversary of Earth Day, founded to raise awareness about environmental protection. Take this great opportunity to teach your children meaningful ways to care for the planet — here are 10 ways to get you started. 1. Grow Native Plants in Your Yard. Planting native trees, bushes and flowers in your yard gives local wildlife and insects a natural habitat. “Native plants are less maintenance, they’re less susceptible to pest damage and they offer critical nourishment to all levels of the food chain,” says Becca Zak, interpretive naturalist for Summit Metro Parks. Many cleaning supplies contain harsh chemicals. Swap out a store-bought cleaner with an environmentally-friendly homemade recipe. Have each family member pick out their own ingredients for added fun. Turn off the lights when you leave the room, don’t let the water run when you wash dishes or brush your teeth, and look for opportunities to walk or bike instead of driving in the car. These small acts of conservation add up when many people are doing them. 5. Read Up on Recycling Rules. We know recycling is good for the environment, but recycling the wrong items can do more harm than good. “Be aware of what you can recycle,” Mikash says. “One of the worst things you can do is recycle the wrong thing. Too many people are putting the wrong material in recycling and, unfortunately, they may have to throw away the whole batch.” Read up on your municipality’s specific recycling rules to ensure you’re recycling the correct way. 6. Start a Compost Pile. Just as you can recycle glass, cardboard and plastic materials, you can also recycle your food scraps and yard waste into a compost pile. The waste is naturally broken down into nutrient rich organic material, which can be used in your vegetable garden or flower beds. Composting reduces greenhouse gases from landfills. 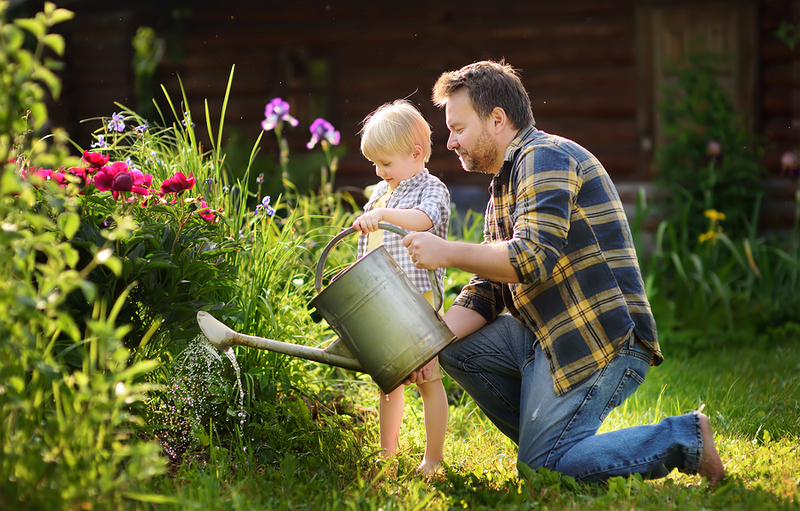 Help your children develop a connection to where their food comes from by purchasing local produce and meat, or spend an afternoon at a “pick your own produce” farm. “Local farmers are oftentimes better land stewards; they sustainably grow produce and they oftentimes raise animals in more humane practices,” explains Zak. 8. Say “No” to Straws. Single use straws are hard to recycle and many end up in the ocean, pollute beaches and harm marine life. Skip the straw the next time you order a drink at a restaurant. If you have to use a straw, opt for paper ones or choose reusable straws that can be cleaned with a straw cleaner. 9. Reduce or Eliminate Single Use Items from Your Routine. Swap out plastic grocery store bags with reusable cloth bags. Use refillable coffee mugs and water bottles. Buy snack foods in bulk and put them in reusable containers. These simple acts will cut down on garbage and lower your carbon footprint. 10. Visit Local and Destination Parks. Show your support for places that conserve land and marine environments by visiting your local park, or make a point to visit an ecotourism destination on your next vacation. “You’re not only educating your kids, you’re also supporting those organizations that offer those services,” Zak says.